Philip said, "Lord, show us the Father, and we will be satisfied." Jesus replied, "Have I been with you all this time, Philip, and yet you still don't know who I am? Anyone who has seen me has seen the Father! So why are you asking me to show him to you? Don't you believe that I am in the Father and the Father is in me? The words I speak are not my own, but my Father who lives in me does his work through me. Just believe that I am in the Father and the Father is in me. Or at least believe because of the work you have seen me do." Philip felt that he needed to see the Father to have greater faith in Jesus. Philip wanted the assurance of God's presence. Jesus reminded him of something he had said again and again. 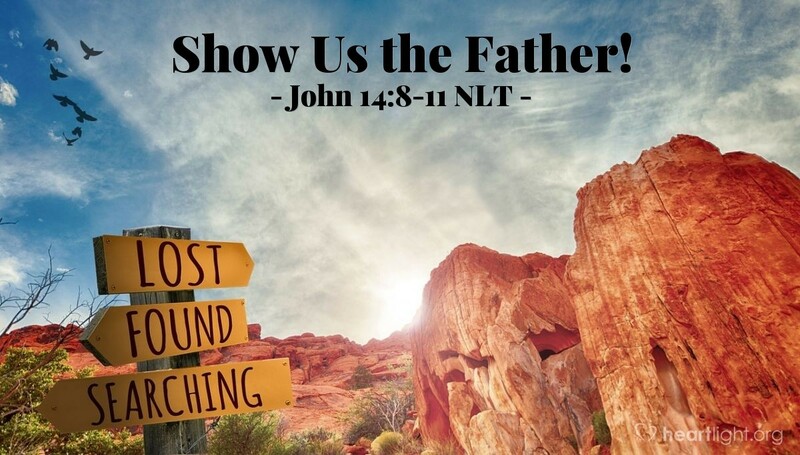 The essence of what Jesus said was, "If you've seen me ... or heard me ... you have seen and heard the Father!" Jesus does the Father's will. He came to demonstrate the Father's love. Look at what Jesus did, how he did it, and why he did it! Jesus is one with the Father! Jesus, my Lord and Savior, thank you for coming to this world and paying the price for my sins. Dear Lord, thank you for showing me how much God loves me. I look forward to your return when I can praise you forever. Amen!